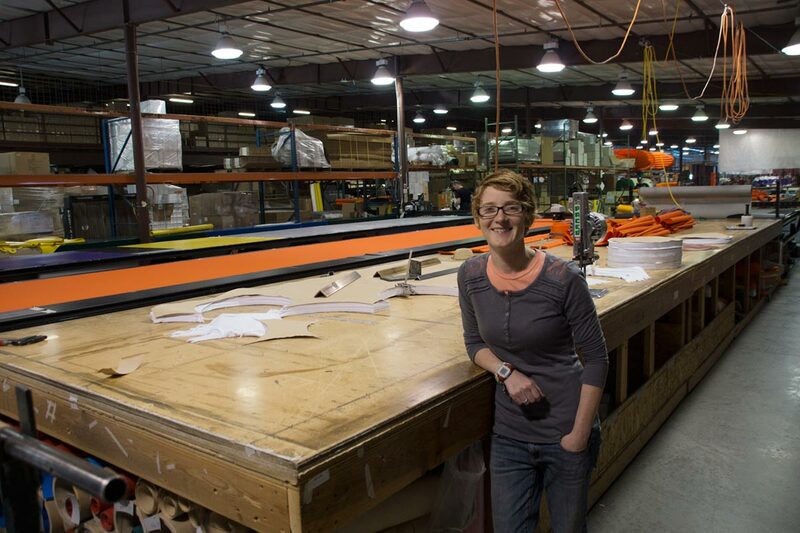 Since we, TheBoatPeople, first visited AIRE's original Boise factory in the early 1990's, they have expanded exponentially. 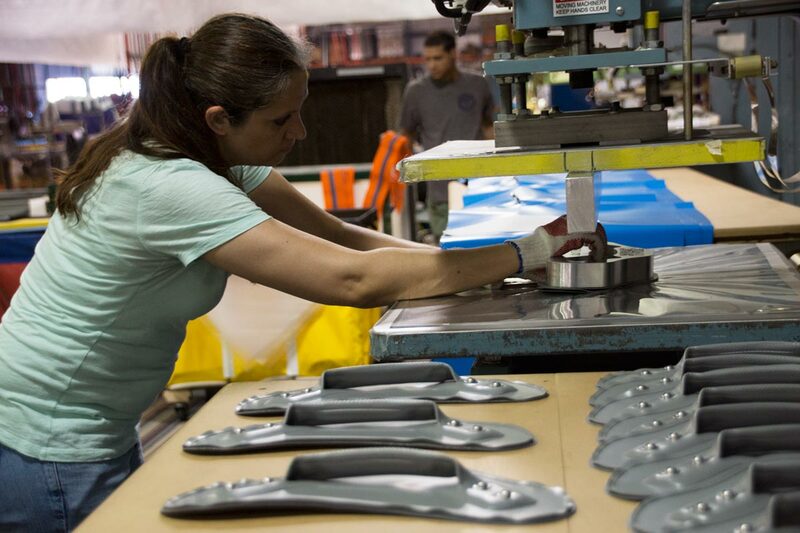 They purchased a new, larger property in Meridian, ID, with much more capacity for boats and the industrial products. When plotters first came about in the 1980's they were used for architectural and engineering drawings, replacing the tedious labor of doing it all by hand with pencils. Not long after their advent, someone realized that plotters could be used for other things. Like cutting out flexible and rigid materials. 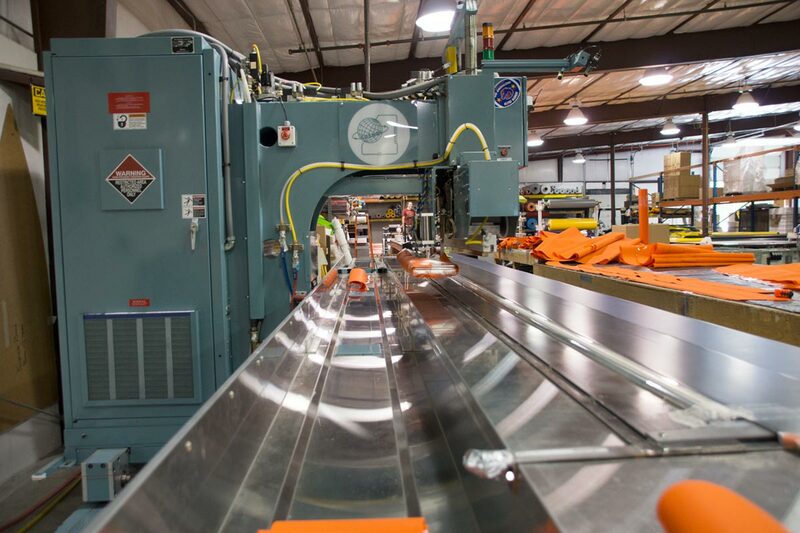 The computer controlled cutting plotter above is creating the floor pieces that will be welded by the machine in the picture below, but at AIRE there are multiple cutters used for all parts of every raft, kayak, and cat tube AIRE builds. Some cut bladder material, and some cut the pvc used for the outer hull. In the image above the eight black lines on the right side are where the I-beams will attach. This behemoth machine is a radio frequency welder used for making the floor bladders of AIRE rafts and inflatable kayaks. 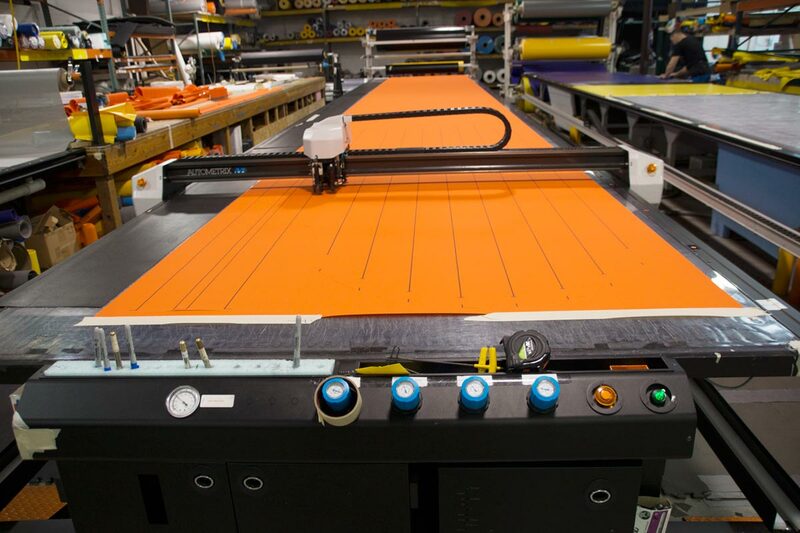 It is set up for welding urethane coated packcloth, which is the orange material you see laying to the right. 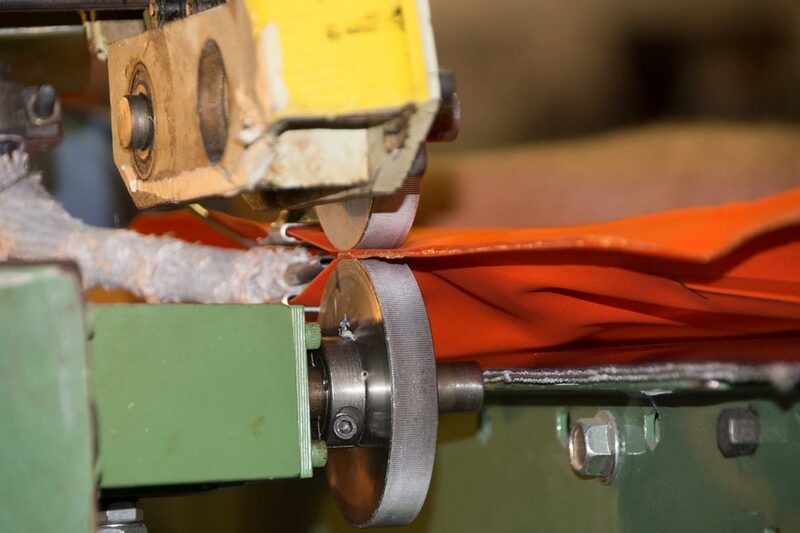 The big aluminum trough is for feeding and sliding the large pieces of material through the welder, which passes current through two layers of this fabric to electronically weld it. Manual Cutting Table with bandsaw cutting out bulkheads. 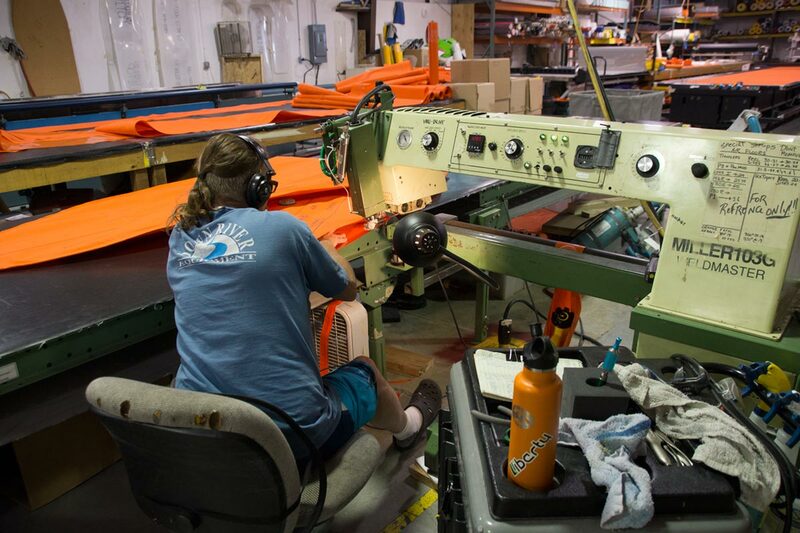 Cutting out a stack of fabric bulkheads for AIRE rafts and cat tubes. These are used as the dividing walls between the air chambers, and will eventually have velcro edges added that hold them in place. One of AIRE's crafty craftladies stamp-welds parts. This machine, like the one up at the top, uses radio frequency to pass current through material. Hand operated, these can do D-rings, footcones on rafts, handles, logo patches, or anything else that's not too big in diameter. 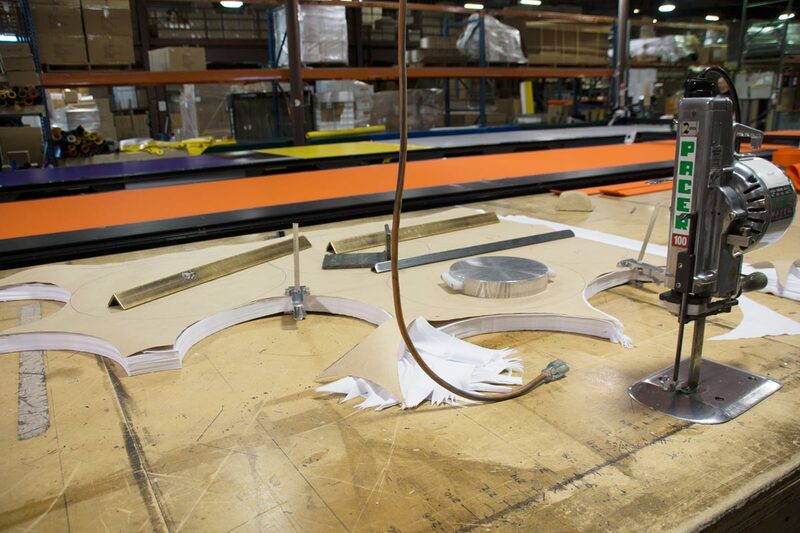 Miller makes many of the welding machines used by AIRE and many other PVC boat manufacturers. The close up above is one of AIRE's rolling feed hot air welders, which sometimes require two people to operate. The wheel (and weld) widths on these machines can vary but most tend to be in the 3/4" to 1-1/2" range. The center-left thing that is wrapped with fuzzy white insulation is the hot air tube, and it's outlet is just to the left of where the two wheels pinch together. The air is super-heated by running through an electric ceramic element. Some of these units also use a flame. With the flame units, when you stop the rollers, the flame goes out.